The 14.5×114mm (.57 Cal) is a heavy machine gun and anti-materiel rifle cartridge used by the Soviet Union, the former Warsaw Pact, modern Russia, and other countries. It was originally developed for the PTRS and PTRD anti-tank rifles, but was later used as the basis for the KPV heavy machine gun that formed the basis of the ZPU series anti-aircraft guns that is also the main armament of the BTR series of armoured personnel carriers from the BTR-60 to the BTR-80 and for heavy anti-materiel sniper rifles. The 14.5×114mm has 42.53 ml (655 grains H2O) cartridge case capacity. The exterior shape of the case was designed to promote reliable case feeding and extraction in bolt action rifles and machine guns alike, under extreme conditions. 14.5×114mm maximum cartridge dimensions. All dimensions in millimeters (mm). Americans would define the shoulder angle at alpha/2 = 22.5 degrees. The common rifling twist rate for this cartridge is 455 mm (1 in 17.91 in), 8 grooves, Ø lands = 14.50 mm, Ø grooves = 14.95 mm. According to the official guidelines the 14.5×114 case can handle up to 360 MPa (52,213 psi) piezo pressure. In C.I.P. regulated countries every rifle cartridge combo has to be proofed at 125% of this maximum C.I.P. pressure to certify for sale to consumers. B-32 API projectile on the left, hardened steel core aside. Tip is black with a thin red band below. On the right, BZT API-T projectile with dark red tip and a wide red band below; hardened steel core and tracer cup on its right. Both jackets and the tracer cup are made from copper-washed steel. Between the cores and the jackets there would be a layer of lead. BS: Armor-piercing incendiary original anti-tank round. The projectile weighs 64.4 grams and is 51 millimeters long with a 38.7 gram core of tungsten carbide with 1.8 grams of incendiary material in the tip. The overall round weighs approximately 200 grams and is 155 millimeters long. The projectile has a muzzle velocity of approximately 1,006 meters per second and can penetrate 30-32 millimeters of RHA steel at an incidence of 0 degrees at a range of 500 meters, or 40 millimeters at a range of 100 meters. B-32: Armor-piercing incendiary full metal jacket round with a hardened steel core. Projectile weight is 64 g and muzzle velocity is 1006 m/s. Armour penetration at 500 m is 32 mm of RHA at 90 degrees. 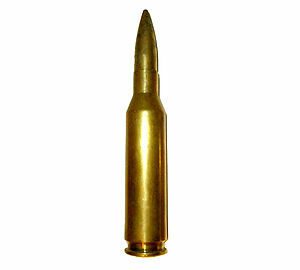 BZT: Armor-piercing incendiary tracer full metal jacket round with a steel core. Projectile weight is 59.56 g and muzzle velocity is 1,006 m/s. Tracer burns to at least 2,000 m.
MDZ: High-explosive incendiary bullet of instant action. Projectile weight is 59.68 g.
Cartridges use lacquered steel cases and a percussion primer. Some countries also use brass cartridge cases. The propellant consists of 28.8 g smokeless powder with seven tubes, designated as 5/7NA powder. Two different versions of bullet series are known, the earlier had a conventional bullet jacket with boat-tail. These had a long engraving portion that caused considerable barrel wear. The newer bullet types have a smaller engraving portion with a rounder boat-tail and were used from about 1957 on. DGJ02: APIDS-T cartridge uses a 45 g tungsten penetrator, wrapped in a discarding sabot (similar to the US military SLAP cartridges) with dual colour tracer to aid ranging. The sabot splits and leaves the penetrator between 150 and 200 m from the muzzle. It has a muzzle velocity of 1,250 m/s and is quoted as being able to penetrate 20 mm of armour plate set at an angle of 60° at 1000 m.
DGE02: APHEI cartridge weighs between 175 and 188 g. At 1000 m it is quoted as having a 90 percent chance of being able to penetrate 15 mm of armour plate set at 30°. At 300 m after penetrating a 2 mm soft steel plate (representing an aircraft skin) it can further penetrate a 1.2 mm thick steel plate producing 20 fragments. Upon explosion between 75 and 95 incendiary pieces are formed which have an 80% chance of igniting aviation fuel. ^ Chant, Christopher (1989). Air Defense Systems and Weapons: World AAA and Sam Systems in the 1990s. Brassey's Defence Publishers. p. 345. ISBN 978-0-08-036246-5. ^ Opposing Forces: Europe. Department of Defense, Department of the Army, Headquarters. 1977. pp. 1–5. ^ "Armor", Volume 81 Issue 6. United States Armor Association. 1972. Page 43. ^ Andrew, Martin (April 2012). "PLA Mechanised Infantry Division Air Defence Systems". Air Power Australia. Retrieved 20 Nov 2012. ^ "Iran unveils new tactical vehicle, sniper rifle". Tehran Times. Archived from the original on 16 November 2012. Retrieved 18 November 2012. ^ "QJG 02 Heavy Machine Gun". Archived from the original on 2 September 2010. Retrieved 29 October 2010. Wikimedia Commons has media related to 14.5x114. Koll, Christian (2009). Soviet Cannon - A Comprehensive Study of Soviet Arms and Ammunition in Calibres 12.7mm to 57mm. Austria: Koll. p. 91. ISBN 978-3-200-01445-9. Archived from the original on 19 October 2009. Retrieved 21 November 2009.